On Friday, September 18th 2015, Samsung Jamaica decided that they’d have an open day for the Spankin’ new Samsung Galaxy S6 Edge Plus! As usually I got invited and I showed up at 3:30pm at the Samsung Experience Store in Tropical Plaza in Half-Way-Tree. The store was decorated with blue and white balloons and the Samsung Girls were out in force. But most importantly, the star of the show, the Samsung Galaxy S6 Edge Plus as per my ditty How Samsung Galaxy S6 Edge Plus Keyboard Cover Nostalgia wins Applause, was on display! Nationwide News 90 FM was on hand to introduce the Samsung Galaxy S6 Edge Plus to the public as per my article How Next is Now for launch of Samsung Galaxy S6 Edge Plus in Jamaica. Good to note that while the Samsung has been increasing in popularity, so too has searches for the Apple iPhone, whose popularity in Jamaica has been Growing Strong, Game of Thrones Style. Jamaicans basically have Samsung on the brain with Google Trends being a strong indicator of which smartphone will be an excellent stocking stuffer this Christmas 2015. For this reason, I suspect, Samsung decided to forgoe the fancy launch and instead, launched the Samsung Galaxy S6 Edge Plus as part of an In-Store promotion. With Nationwide News as the media partner, Samsung launched the hashtag #MyS6edgeplus in a walk-in store promotion where customer could walk in and take a selfie for a chance to win the Samsung Galaxy S6 Edge Plus as explained in How to win a Samsung Galaxy S6 Edge Plus using Twitter hashtag #MyS6edgeplus. And take selfies they did as shown in the images below. The Samsung Girls decked out in tight pencil mini-skirts bared their midriffs as they greeted me, giving me a Samsung Blue cup cake with white frosting. They wore epaulettes at their top right and also wore a pair of wooly blue antennas sprouting out of the heads. The Samsung Experience Store staffs were also dolled up in white tees reflecting the screen of the Samsung Galaxy S6 Edge Plus. There was a selfie wall at the back near to the cashier’s table with the Words “Samsung Galaxy S6 Edge +” in black lettering against a white background. To be honest I was really hanging around to see if I could get a chance to win the Samsung Galaxy S6 Edge Plus. But I soon found that the Samsung Galaxy S6 Edge Plus was more than just a gimmick. 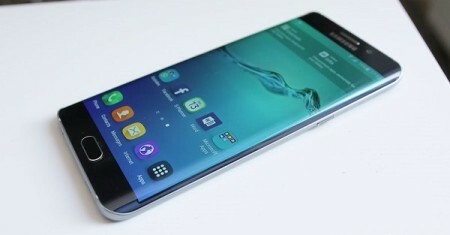 The Samsung Galaxy S6 Edge Plus Edge Tab appears as little protrusion on the curved edge of the smartphone. Simply pull it out in order to gain access to the Edge Tab menu, which consists of shortcuts to your Contacts and Apps you frequently use. Swipe it once and you get shortcut links to your most frequently called Contacts. A second swipe gives you access to your most frequently used Apps, which you can add to by using the Plus button. The Edge Tab protrusion can be moved up and down by simply grabbing the Gear icon in the Contacts menu and dragging it to the location that you wish to have it located. You can also choose which side of the screen you wish to have the Edge Tab protrusion, be it on the left of the screen or on the right along with other settings. Because the Samsung Galaxy S6 Edge Plus has an edge screen, even if for some strange reason you place the smartphone on its face, it’ll light up on its edges to indicate that you’ve received a call or a notification for a message. You can setup your Samsung Galaxy S6 Edge Plus to send out an auto reply once you place your finger over the rear Camera sensor. When the Samsung Galaxy S6 Edge Plus is on its back, like normal people do, you can also set it up to give you information. It can be configured in settings accessed by the Gear icon to act like a news ticker, a display clock at night on your bookstand as well as show missed calls and message notifications. Best of all, it can act like an alarm clock. So not bad, Samsung! I personally wished I’d have won the Samsung Galaxy S6 Edge Plus, but I didn’t stick around long enough to win. Eventually a Mr. Vernon Barrett won the phoneas shown below. He looks an awful lot like Neville Bell from Smile Jamaica, the fairly popular Morning time show on Television Jamaica. But truth be told, he’s also representative of the target demographic; older returning resident that can afford to spend JA$125,000 on a Samsung Galaxy S6 Edge Plus. I left the event at 3:30pm, thoroughly impressed and certain that the Edge Tab was a useful addition to the Samsung Galaxy S6 Edge Plus. I was also told by one of the In-Store representatives that the Samsung Galaxy Note 5 and the Samsung Gear S2 might have their own launch events later in the year! Rest assured, the Samsung Galaxy S6 Edge Plus is going to be the smartphone present of choice come Christmas 2015, no matter what the price!